If, on the way to your desk, you pass that one person in the office who absolutely won't go home, even though their face is exploding with mucus, don't count on a day off. Just looking at sick people can kick your immune system into gear. You are not having a good day when you sit down to watch a slide show. Already, you've been poked in the arm by scientists so they could collect your blood. You don't even know why they did that. Now you're watching a bunch of pictures slowing click by, one by one, on a screen. A chair, a couch, a car, a pair of pants. Oh, it's fascinating. 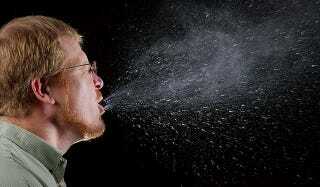 Then you see a person sneezing. You see an old photograph of a person covered in pock marks from smallpox. You see someone with an unidentifiable rash. You see skin yellowed with jaundice and puffy with infection. Then the scientists come back and jab you in the arm again. For you, the day is a wash. For the scientists, it turned up an interesting result. While you watched the slideshow, your immune system started pumping out things called cytokines. Cytokines, as a group, are so varied that doctors are not sure whether they really do belong in just one group. They can be proteins or peptides. Some are generated by any cell with a nucleus, and some by specialized cells. And, although they're all linked with the immune system they all have different functions. The ones generated in your blood by the slide show were bacterial-specific cytokines. One type, called interleukins, signal a special kind of white blood cell in your extracellular fluids. This white blood cell, called a B-cell, goes after bacteria. Another type of cytokine patrols the blood looking for infected macrophages. Macrophages engulf and "eat" foreign bodies, but some bacteria hack them, and live inside the macrophages. These cytokines find infected macrophages and activate processes that allow them to kill the bacteria inside them. These were the things swimming around your blood after you saw the slide show. They were not swimming in the blood of one of your fellow volunteers — a member of a group that saw a slide show of neutral and boring images, followed by a slide show of violent images. Although they'll have reacted to unpleasant images, they won't be on the alert for contagion. Obviously, it takes more than just the right mindset to fight off bacteria, but these experiments do show us that merely seeing infection can make our bodies crank up defenses against it.